AD Tidy was one of the first programs I released and has been one of my most popular free tools, with tens of thousands of downloads since it was released. Well I’ve now started re-writing it from the ground up and thought I would provide some early screenshots and details so you know what you can expect. 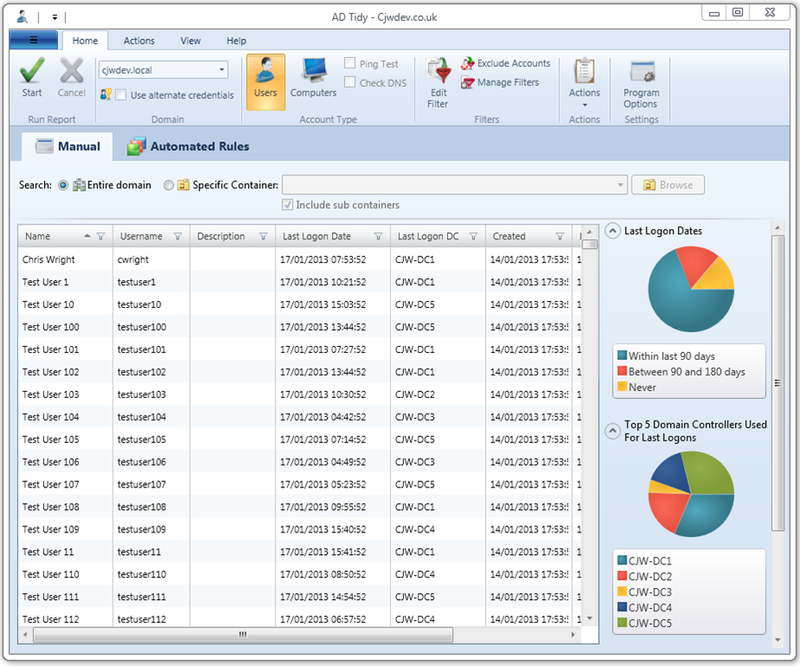 Back in 2010 AD Tidy was the first program I ever made that was built specifically for other IT Pros to use, rather than just being a tool I made for my own use and use within the company I worked at (like everything else I had made up to that point). It has had a few updates since then, but now I am completely re-writing it from the scratch to improve the user interface as well as performance and functionality. As version 1.0 of AD Tidy was the first program I released to the public it seems quite fitting that version 2.0 is going to be the first program I’ve created since leaving my job as an IT Pro late last year to focus on software development. Sure I’ve released minor updates for other programs since then, but this is the first project I’ve started from scratch and as such I’m determined to make it as good as it can possibly be. Below you can find early screenshots of the user interface and I will be posting another blog entry soon with more details on the new features and improvements that will be in this new version, including the automated rule support that will be available in the standard edition (yes I’m introducing a paid for version but don’t worry the free edition will still be able to do everything the current free version can do and more). To be honest although I’m still not keen on the Ribbon menu in programs like Word and Excel where you have a huge amount of actions that you might want to perform, I think it works quite well for tools like mine where you are just configuring settings for a report and performing a few actions on the results. Anyway let me know what you think of the new UI and if anyone has suggestions for improvements I’m always keen to hear them. Oh and I finally got the “No Adverts” upgrade for WordPress and got a new theme which allows for wider paragraphs so it is a bit easier to read now. Will there be any way to schedule ADtidy so I can automate my weekly cleanup routines? That would be awesome! Oh man that’s sweet! Thanks Chris.